"Joshua BARTLETT and wife (Winnie, nee WILLIAMS) moved from Boonesborough, KY with their eight children about the year 1808 and built a cabin on the south bank of Falling Water, near the location of the concrete bridge on the new highway through there. The original entry of land by Mr. BARTLETT embraced 360 acres on Falling Water, the bottom land thickly covered by tall cane." It is possible that this is the 360 acre farm owned by Alfred and Zona Bartlett for much of the 20th century. His family was always told that they had to pay for the farm twice because they failed to get a clear title the first time they purchased it. First let's look at how Joshua got the land he owned. It seems that 167 acres of it came from his nephew James Bartlett, his brother Joseph's oldest son. 15. JAMES BARTLETT, born ca 1786 Henry Co. VA, died July 1815 Dry Valley, White Co. TN, married aft. 1806 Nancy (Unknown). 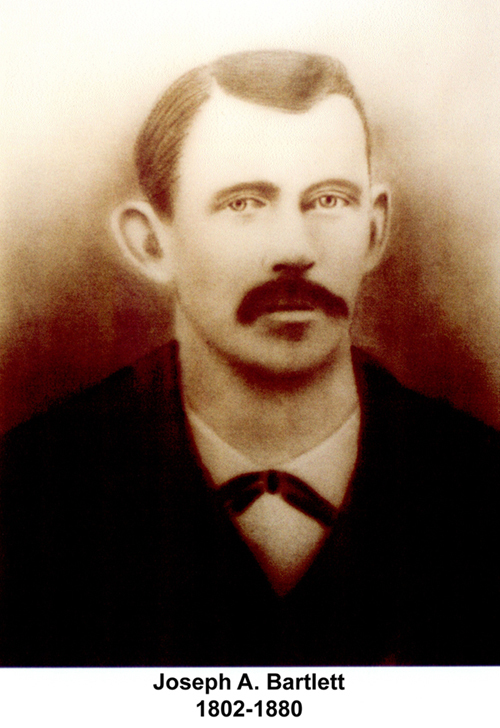 James BARTLETT, the first child of Joseph, brother of Joshua and Nathan, became one of the early members of the Big Springs Baptist Church in Claiborne Co. In March 1806 he obtained a letter of dismissal from the church and in May of 1806 he was received by letter in the Spring Creek Baptist Church in Jackson Co, TN. 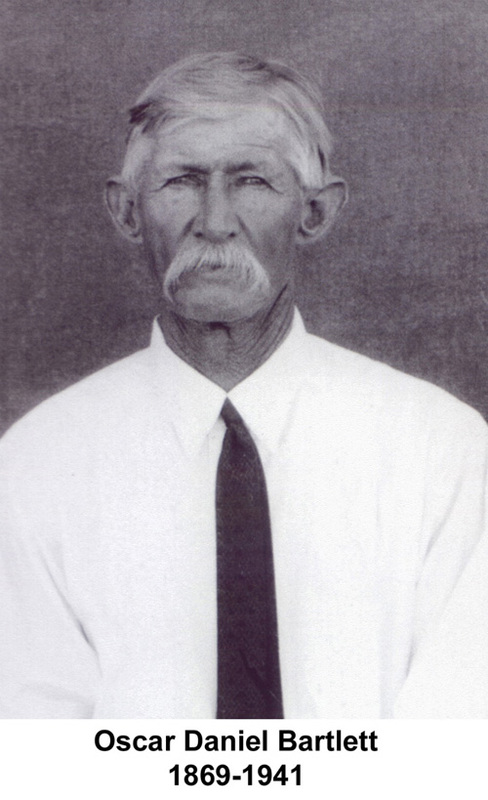 He went there with Thomas HILL and his son Abner HILL who had planned to locate a home in White Co, TN. In the fall of 1806 the HILLs returned to Claiborne Co. to bring their family out. James BARTLETT joined them in going to Claiborne Co. On the return trip all three of the BARTLETT young folks came along, viz: James, John and Sarah. During the trip Abner fell in love with Sarah and they were married in Dec 1806. 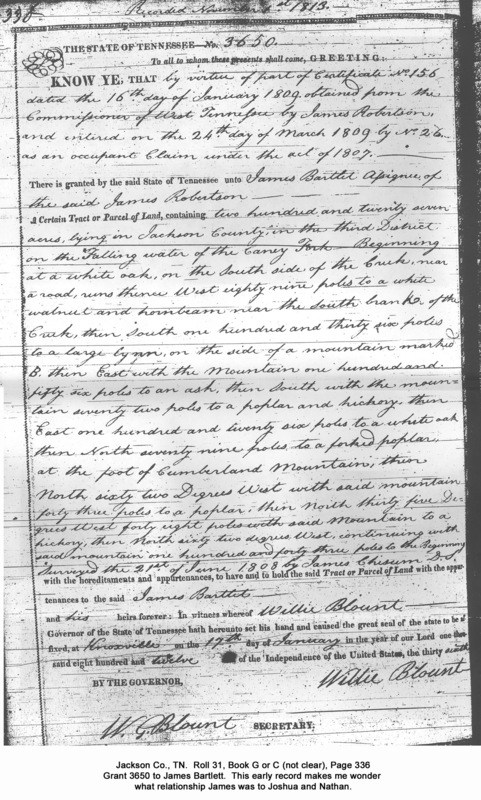 James BARTLETT decided not to return to Claiborne Co, but to join his uncles, Nathan BARTLETT and Joshua BARTLETT, in Dry Valley, White Co, who were brothers to his father, Joseph BARTLETT. Actually Joseph BARTLETT had moved from Hawkins Co. to Dry Valley, White Co, TN by 1810. James was a very active man and soon married Nancy (maiden name unknown). He also made an entry of 227 acres of land in Dry Valley adjoining Joshua BARTLETT. It wasn't long until he started a family in which he had two boys, Thompson Martin and John. We do not know their exact ages. He obtained the grant on the 227 acres by 1812. James Bartlett received a land grant from the State of Tennessee on 24 March 1809 for 227 acres on the shore of Falling Water River. It was recorded on Roll 31, Book G or C (not clear), Page 336, Grant 3650. Click on the image of the land grant to open a large view in a new window. 61. Thompson Martin BARTLETT, b. 1802 Caswell Co., NC, m. 19 Jun 1826 Caswell Co. NC Susan MOORE. 62. John BARTLETT, b. aft. 1809. James sold most of the land grant, 167 acres, to Joshua on 18 January, 1815 as recorded in the White County deed books on rool 61, book E, page 345. The land sold had the above shape. It's apparent this is part of the above land grant from the shape as well as it is mentioned in the deed. Joshua Bartlett had two brothers, Nathan and Joseph. We know that Nathan stayed close to Joshua on the Falling Water River. What about Joseph? In 1791 the Joseph Bartlett family moved to Hawkins Co, TN where the mother died about 1793-94. Joseph, not knowing what to do with the three children, placed them in the custody of their Grandmother SIMS. Also helpful with the children was their Aunt Lucy CHISHOLM. By 1796 Joseph had married Millicent RICE and started a second family. About 1810 Joseph and his family moved from Hawkins County to White Co., TN, remaining there through at least 1815 [Tax lists-land on Phillips Crk]. From May 1824 through Feb 1836 Joseph and Millicent were members of the Spring Creek Baptist Church (Overton/Jackson Co., TN). Joseph died in 1838 in Overton County, TN. While he was in the general area of Tennessee as his brothers (20-30 miles) he was not in the Falling Water Creek area. 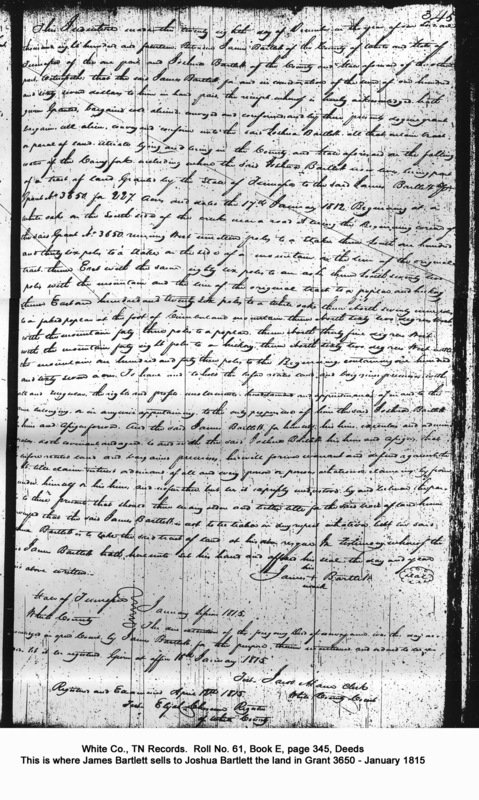 The following will for Joshua Bartlett was filed on 14 July 1828 and leaves his property to be split between his three sons, Nathan, Joseph, and Daniel. Nathan got the house where Joshua lived. Joseph got the house he was living in on Joshua's property. Daniel got the part of the farm that joined Dry Valley. Transcribed and contributed by Carol A. Selander. In the name of god amen I John (crossed out with Joshua written above it) BARTLETT of the county of White and State of Tennessee being sick and weak of body but of sound mind and disposition moving for which I thought good and calling to mind the uncertainty of life and for being desirous to dispose of all such worldly substances as it hath pleased God to bless me with I give and bequeath the same in the following that is to say I give and bequeath unto my oldest son Joseph BARTLETT the part of land he now lives on and Daniel BARTLETT my next Oldest son is to have that part of land that joins the dry valley and Nathan BARTLETT my youngest son is to have the part of land where my house is at present and the land to be equally divided between the three sons so that every part should be alike and my wife Winney BARTLETT is to have support from off the land and possession of the dwelling house and Cittion during of her widdow hood and my daughters Winney BARTLETT and Hettey BARTLETT is be supported from off the land with their mother tell they come of age or is married and my daughters, that is to say Cadey RANDOLPH and Penney BOHANNON and Nancy BARTLETT and Polly (Could be Hetty or Holly) BARTLETT to have a good fifty dollar horse each of them as soon as it can be raised apart of this stock not to injure it to much, and my two sons Daniel and Nathan BARTLETT is to have each one his own horses. Daniel is to have his horse and Nathan his mare and colt and to have possession of all the balance of the stock but is not to trade or commit it to his own use further than to pay off the other heirs that is here named and the Balance of the property is to be for the use of supporting their mother and the youngest sisters in the house and they are to rise William WHITAKERs two two children till of age and school them otherwise if he sees cause to take his children himself and rase them then those two children is to have fifty dollars in property divided between them when of age. And concerning Thomas RANDOLPH I have given him an equal share to the rest of my heirs My three sons excepted and I don’t allow him any more of my estate and the stock that is raised on the land to be their own tht they make by their own industry I do hereby constitute and apparent my wife Wiinney BARTLETT and my son Joseph BARTLETT Executors of this my Last Will and Testament hereby Revoking all other former wills or testaments heretofor made. In witness whereof I have hereunto set myhhand and seal this twenty third day of September in the year of our lord one thousand eight teen and twenty three. State of Tennessee White County July session AD1828 the dec __________ of the _________ ____________ will and testament of Joshua BARTLETT dec was this day proven in open court by the _________________ and __________ William PRYOR and __________ subscribing satisfaction _________ for the _________and things _________ mentioned? ____________ it to be _________ _________ at _________ and the (14 or 4) July AD1828. Joseph and Nathan died and were buried in MS and Daniel died and was buried in MO. It's likey that when they left Tennesse they sold the farm to either their uncle Nathan who didn't die until 1837 or to one of his children, possibly James because James seems to be the only son of Nathan who stayed in the area. Let's examine the records we have. By 1840, William and Joseph BARTLETT, sons of Nathan, had moved to MO. Only son James BARTLETT was recorded in the 1840 White Co, TN census. [1840 MO Census. Taney Co, Swan Twp, p. 115]. By 1845-46 Joseph A. BARTLETT had settled in Texas in a town called Fenton (which no longer exists) on the banks of the Trinity River as part of the C. F. Mercer Colony. 8. JOSEPH A.3 BARTLETT age 68 was born 03 Jan 1802 in , Jessamine Co., Kentucky, and died 03 May 1880 in Oakville, Live Oak Co., Texas. He married (1) ELIZABETH BARTLETT69,70,71 1824 in , , Tennessee, daughter of JOSEPH BARTLETT and MILLICENT RICE. She was born 1809 in , , Kentucky or Tennessee, and died Bef. 1855 in , Henderson Co., Texas. He married (2) MRS. MARY ANN MCWHORTER72 22 Jun 1874 in , Live Oak Co., Texas73. She was born Jan 1841 in , , Arkansas, and died in Oakville, Live Oak Co., Texas. Know ye, that for and in consideration of the sum one cent per acre paid unto the office of the Entry of White Co. and entered on the 13th day of Feb 1827 pursuant to the provisions of an act of the General Assembly of said state proper on the 22nd day of November 1823 and the Acts Supplemental thereto by No. 1284. A certain Tract or Parcel of Land, containing twenty five acres by survey bearing the date of 5th Apr 1827 lying in the said County of the water of the Falling Water of the Cany Fork and bounded as follows, South beginning at a stake on the bank of Falling Water running thence East 112 poles to two ____ on a mountain, thence South 70? Poles ___ thence ___ oaks in Joshua Bartletts line and ___ 76 poles to a stake in a ____ thence North 12 poles to the Beginning. Including and excluding a four acre tract belonging to A___ Church. With the hereditaments and appurtenances, to have and to hold the Tract or Parcel of Land with the appurtenances, to the said Joseph Bartlett and his heirs forever; In witness whereof Samuel Houston, Governor of the State of Tennessee, hat hereunto set his hand and caused the great seal of the state to be affixed at Nashville on the 4th day of May in the year of our Lord one thousand eight hundred and twenty eight and of the Independence of the United States, the 52. County, White, Roll No. 63, Book L, page 360-363, Record Deed from Tennessee Archives and Library. James Bartlett Bartlett of the State of Missouri and County of Taney as by these presents nominate, constitute and appoint my Trusty friend and brother, James Bartlett of the County of White and State of Tennessee my lawful attorney for me and in my name to collect, receive, such for all monies or other property due and coming to me as one of the heirs of Nathan Bartlett Dec'd and to give receipts and releases and do every thing that may be necessary in ..ing the business of said estate as fully and effectively as I would as the same were I personally presents, satisfying all the acts of my said attorney. Given ___ my hand and seal this 4th September1837. presents, release unto my brother James Bartlett of the County of White and state of Tennessee the interest I have ___ and coming to me from my fathers estate Nathan Bartlett he having paid me in the full amount of said estate to what is considered the amount; hereby requesting the administrator of said estate to pay over the same to said James Bartlett whose receipt shall be given for the same. Given....4th Sep 1837. Note: Joseph A. was probably 29 (born Jan 1802) and could have listed himself as age 30, also possible he thought he was 30 or his wife did. By 1840, William Bartlett and Joseph Bartlett, sons of Nathan, had moved to Missouri. 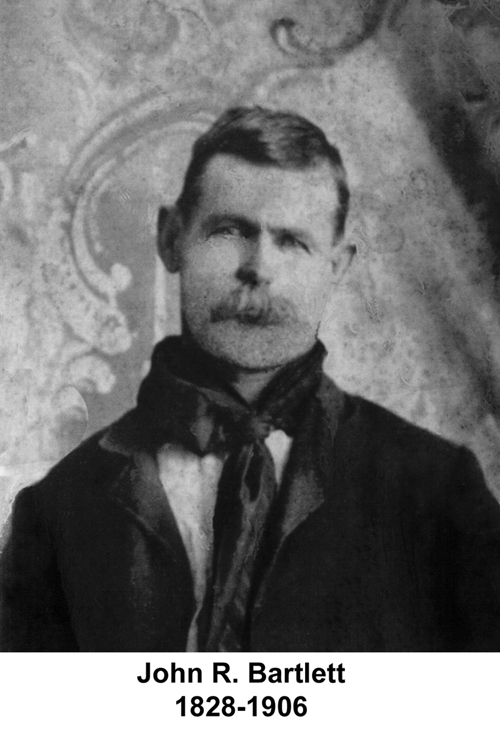 Only son James Bartlett was recorded in the 1840 White Co., Tennessee census. So it looks like James, son of Nathan, ended up with Joshua's land in addition to his own and that most likely is the basis for the 365 acres Alfred Bartlett farm. 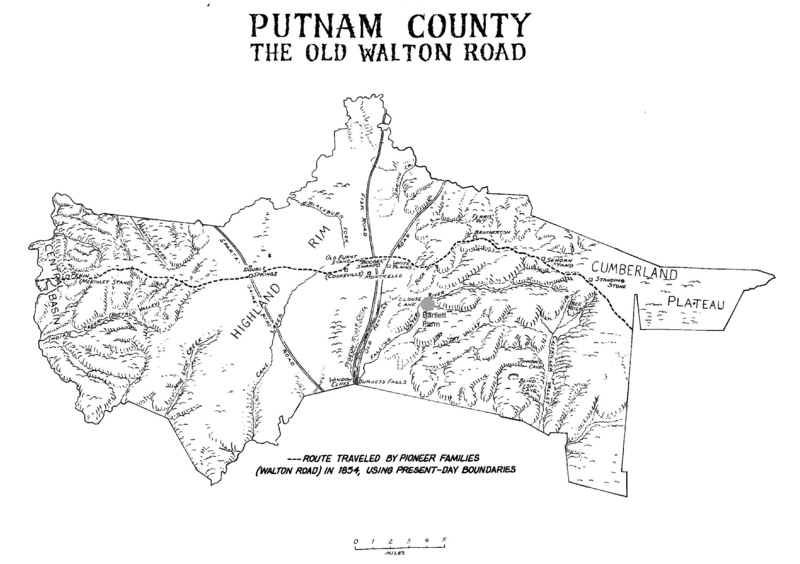 Below is a map of Putnam County in 1854. I've added a gray dot where The Bartlett farm was located. It was sold after the death of Zona Bartlett and much of it is now a subdivision. Click on the map to view a larger version in a new window. The topo map below shows the location of the Alfred Bartlett farm. Note the location of the cemeteries indicated by "cem" on the map. One is the Bartlett cemetery on the Bartlett farm and the other is the Browns Mill cemetery on the other side of highway 70 on the north side of the Falling Water River.